Welcome to Thesprotia, the birthplace of Hellenism, featuring an amazing eco system, with mountains, rivers, lakes, deltas, coastal trails, along with archaeological sites, historical monuments, various monasteries and churches that magnetize every visitor. Visit its capital city of Igoumenitsa the most nodal Epirotic port to connect the country with Europe, the heroic area of Souli and the traditional hamlets of Paramithia and Filiates, also featuring historic monuments that unfold their glorious eventful past, all surrounded by wonderful landscapes of rich forests, valleys, rivers and lakes. 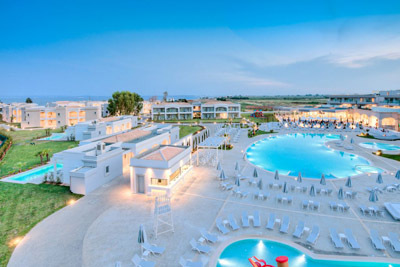 On the other hand, the seaside resorts of Syvota or Perdika offer the required infrastructure to make the ideal summer resort, with numerous luxury hotels and spa resorts, some of which to offer conference facilities, while around the prefecture and especially its highlands, several traditional hotels and villas offer ideal opportunities for the visitors to get accustomed to the local life style. As nature has endued this region with untold beauties, it has inevitably become a paradise for the ecotourists and those who enjoy outdoor activities. The beautiful coasts of Thesprotia are famous throughout Greece for their clean jade waters and soft sandy beaches stretching for several kilometres to guarantee relaxing times. Tourists with archaeological as well as religious interest, will also be well rewarded after a visit at this blessed land. 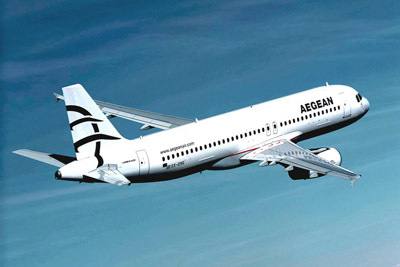 The prefecture of Thesprotia can be accessed by road or sea as the nearest airports are the ones of Action in Preveza or in the island of Corfu. From the city of Athens, as well Thessaloniki and Patras the new national roads provide direct access to the central city of Igoumenitsa via the new bridge of Rio – Antirio or Egnatia Odos. 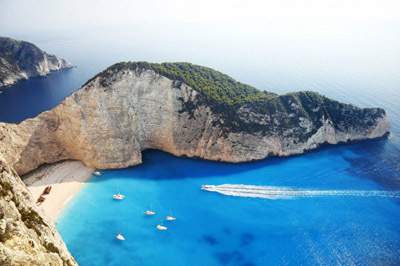 The port of the city is a central hub to connect the western part of Greece with the Ionian Islands, Italy and Albania through the ports of Corfu, Paxoi, Patra as well as Bari, Printezi, Venice, Ancona and Avlona respectively. 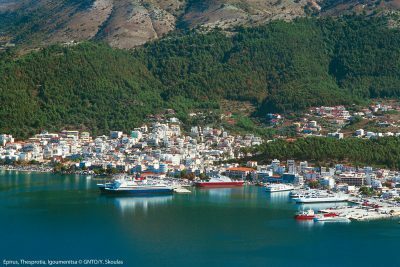 The region of Thesprotia features its capital city Igoumenitsa along with numerous wonderful seaside resort and mountainous villages. 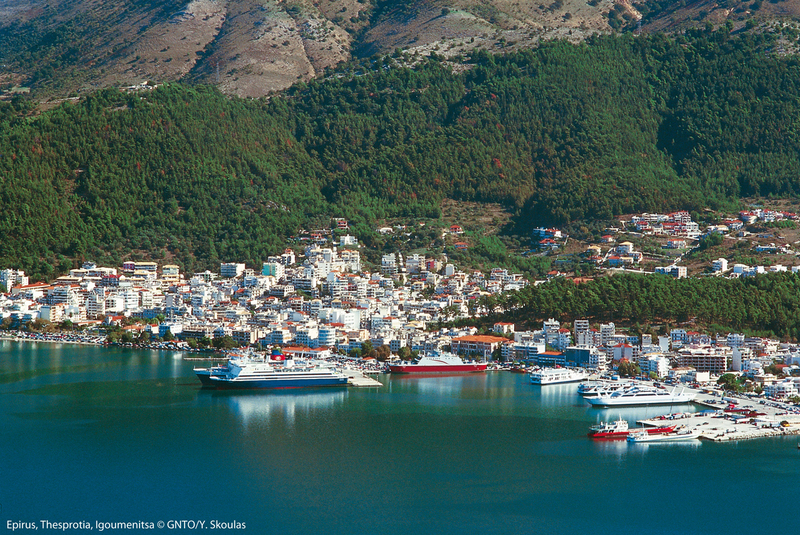 Igoumenitsa is the capital of the prefecture and the main port of Epirus being the commercial and political hub, situated right across the island of Corfu. The city is surrounded by pine-laden hills and has a wonderful seaside road lined with sycamores and a park. Right above the city a visit at the Kastri forest well worth a visit, along with Drepano, a beautiful area with a lovely beach and a lagoon. The summer resort of Syvota is among the most attractive areas of this part of Greece, with four small green islets, endless olive groves and marvellous beaches. Other popular seaside villages are Perdika and Sagiada, with wonderful beaches to offer lots of fresh fish. 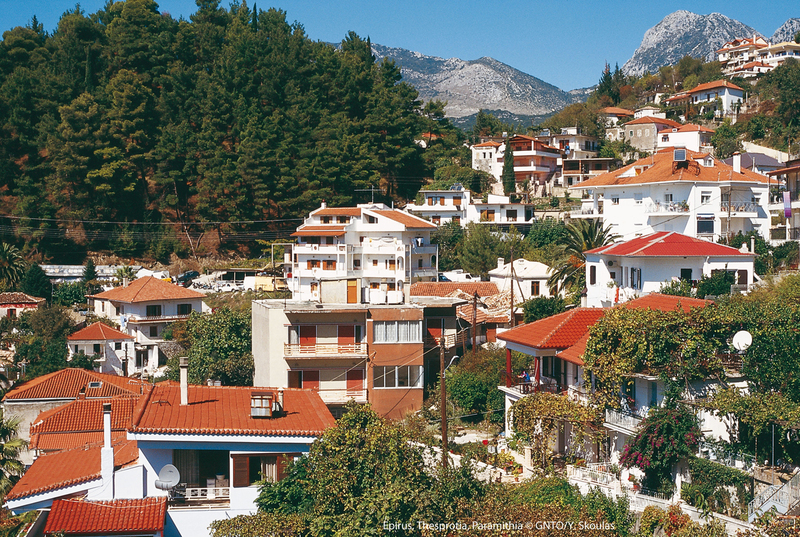 The mainland of the prefecture is equally attractive with traditional villages such as Paramithia. 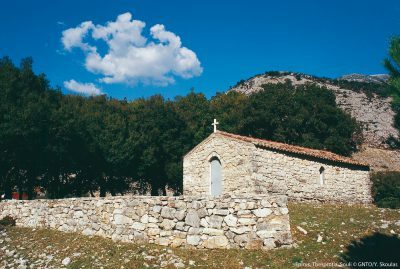 Located between the rivers Acherontas and Kalamas, on the foothills of mount Gorila, the village of Paramythia is a traditional hamlet to house amazing churches, monasteries and forts. Filiates is another historical settlement of the area, also ideal for nature lovers as it is charmed with rich forests, mountains, rivers, arched stone bridges and walking trails. The mountainous area of Souli, other than offering stunning sceneries with flourishing nature, is a heroic and glorious area, renowned for the struggle of the locals against the Turks. Interesting sights include the following villages; Avlotopos, Tsangaris, Koukoulioi, Frosini, all perched on Gorila slopes. Last but not least the village of Glyki with the lovely water springs of Acherondas River and the canyon offer impressive scenery. The long history of the area initiating at the prehistoric times, while playing an important role at the country’s history, is vividly reflected on the various remaining monuments and museums. Gitani is a site of significance nearby Filiates, as it hosts the largest ancient walled village of the prefecture, built during the 4th century BC. Other than being naturally protected by the Kalama river that surrounds it, the ancient city was protected by its over 2km long polygonal walls to embrace marble door thresholds, an Ionic portico in the marketplace, a small temple, private homes and public buildings beautifully decorated with mosaics, and ancient theater with over 5000 spectator capacity. The village of Velanis features the Ancient Elea that reveals an excellent example of an ancient Thesprotian city with polygon walls a theatre, the place of Agora, a small temple and public buildings. Nearby Perdika village is the seaside fortified settlement of Dimokastro with over 3km walls featuring walls, remains of buildings, tunnels, water wells that stretch till the coast. The site of Ragiou tower occupies the top of a hill in the middle of a plain, close to Kalama River, to include an Ottoman tower built on remains of an ancient fort, nowadays hosting rubble walls and a tower, centrally places on a site of exceptional natural beauty. At Souli, apart from admiring the wonderful natural landscape, visitors can pay a visit at the local Folk Museum that reveals aspects of everyday life of the locals during the previous centuries. The area also features several monasteries and churches most significant being Panagion Monastery, built in 1652 close to Paramithias village, right on the slopes of a mountain, including a well preserved catholic room with impressive frescoes. One of the most important monastery centers in Epirus was the Giromeriou Monastery, built during the 14th century, to financially support several villages and operated as Krifo Scholio, Hieratic School. 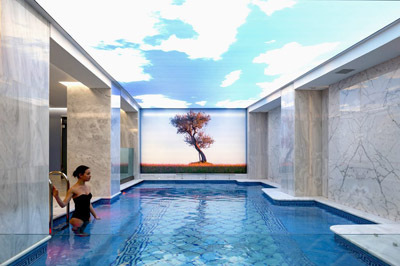 The church features exceptional Byzantine frescos and folklore frescoes as well as heirlooms, to impress every visitor. The rich environmental wealth of the region of Thesprotia, is ideal for a large range of outdoor activities especially at the highlands charmed with mountains, rivers, caves, gorges and hiking trails. 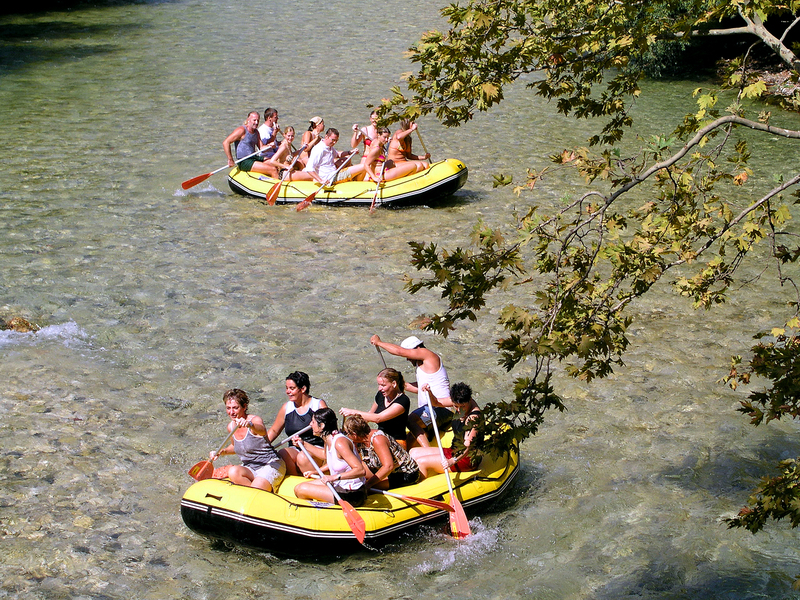 At the local rivers lovers of Kayak, rafting, canoeing and canyoning enjoy moments of excitement, while the mountains offer for hiking, mountaineering, paragliding, mountain bike, jeep safaris and horse riding. Additionally the wetlands of the area are ideal for bird watching. 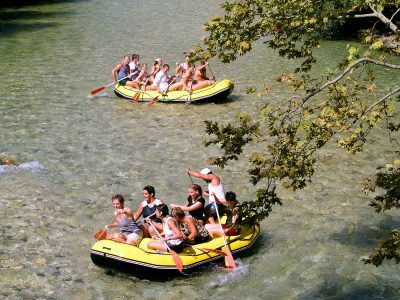 The lovers of the sea on the other hand can choose between a large variety of sea sports along with fishing and diving. 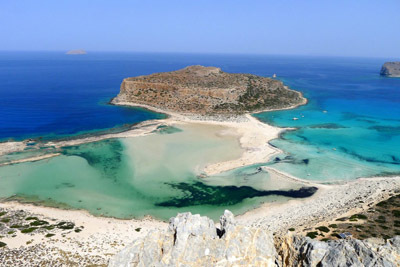 Beaches are indeed the landmark of the area full of small coves and bays some of which being awarded with Blue Flags, with crystal clear waters and sandy shores nested on a landscape of rich vegetation. 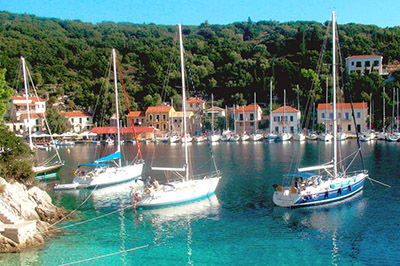 Some of the most popular beaches are Megali and Mikri Ammos, the first one being the biggest along the area of Sivota, a white pebbled, and fully organized beach. At the same area the beach of Bella Vraka is a unique site as it is situated at the island of Mourtemeno, which can be actually reached on foot while walking on shallow waters, while the scenic beach of Pisina, named after the swimming pool effect of its waters can only be reached by boat. 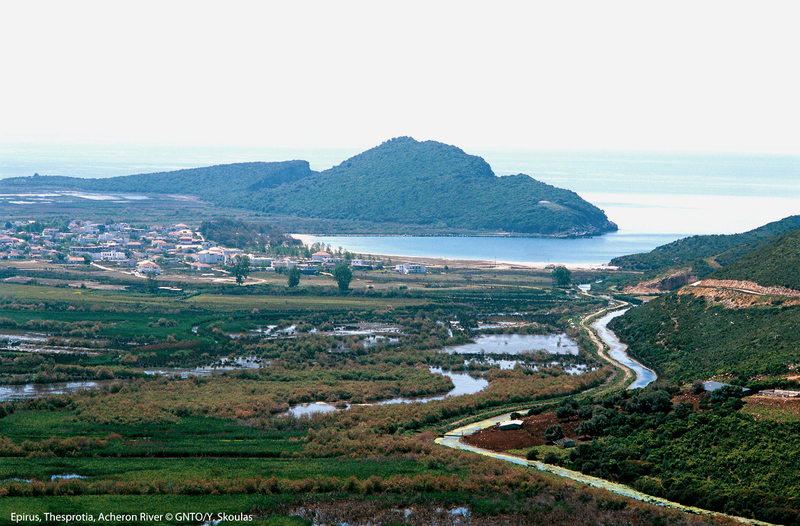 Next to the city of Igoumenitsa is the 7km long Drepano beach to attract large numbers of visitors. The area of Perdika also features a number of sandy beaches with Karavostasi being the largest one to offer several tourist facilities and resorts. The area, along with Sagiada region, have a number of secluded beaches with blue waters, surrounded by lush green hills such as the beach of Strovili. The green lands of the region offer for cultivation of fresh vegetables and fruits such as citrus fruits, corn, alfalfa and of course olives, along with livestock breeding. 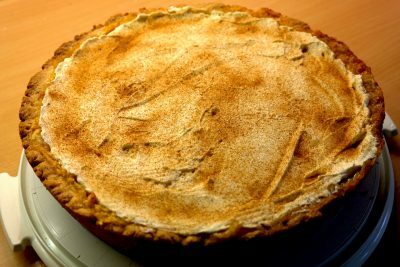 The local specialities include flour pie, Lamb ”kleftiko”, pork meat cooked as ”kontosouvli”, cabbage, meat and flour pies, home made pasta as well as frog legs. Local sausages and cheese are excellent meze to accompany the local raki drink.